Whilst well established and publicised now, the link between the Catholic church and systematic child abuse was once well hidden. This matter of fact, non sensationalist film details the process and procedures undertaken by dedicated journalists to follow the story wherever it lead. As the story unfolds, the true scope of the scandal becomes increasingly obvious and the look of the journalists incredulity will be reflected by the audience. There are many quiet thoughtful scenes with arguably the best use of the number 90 in cinematic history. Following a brief introduction to how “incidents” were swept under the carpet in 1976, we fast forward to 2001. 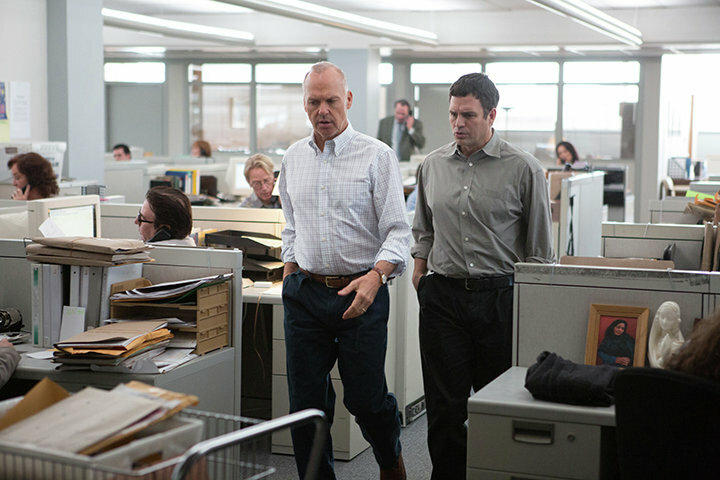 “Spotlight” a team of deep investigative reporters headed by Walter “Robbie” Robinson (Michael Keaton) working for the Boston Globe newspaper are searching for their next story. Fuelled by a new editor from out of town, Marty Baron (Liev Schreiber) nudges the team into delving into dark corners, areas that many had an interest in keeping the light of justice well away from. Reporters Sacha Pfeiffer (Rachel McAdams) and Mike Rezendez (Mark Ruffalo) continue to track down possible cases and start interviewing victims, there are plenty to meet. Brave people coming forward to tell their stories with no guarantee they will be believed or treated well as a result. The Catholic church at the local and much higher level, strives to keep the status quo. Families were bought off with a combination of shame, money and assurances that “it could never happen again”. A few bad apples should not allow the overwhelming good to be destroyed or dismantled. The film is all the more effective for the matter of fact presentation of increasingly chilling facts and stories unearthed as the investigation continues. Facts are initially not believed because they cannot be true, can they? Arguably the most disturbing aspect is that everyone “knew” and yet many pretended not to see what what was right in front of them. Whistle-blowers a plenty but no one listening, least of all the hypocritical hierarchy of the Church. The cast are uniformly good, with such a story anything less would have been a travesty. Ruffalo in particular finds yet another character we can believe in, Keaton continues his on screen renaissance. Adams and Tucci put in solid turns and Schreiber albeit in a small role, makes every scene count, everyone needs a boss like him. This is no diatribe or polemic, the facts are set out, everyone is partly guilty. Of course if anyone believes all such abuses have been exposed and preventative measures put in place, we have a Nigerian investment opportunity for you to consider. A quiet film which paradoxically manages to shout loud and clear the injustices enacted in the name of the Catholic Church. Not an angry film but all the more devastating for the lack of histrionics . A worthy best Oscar picture choice with a great story, fine actors and intelligent dialogue. Which in modern cinema is a rare find indeed.